«©NCSX» Who amongst you is strong enough, agile enough, and brave enough to take hold of the Hokuto no Ken Balance Game and whip it around like a ping pong paddle? 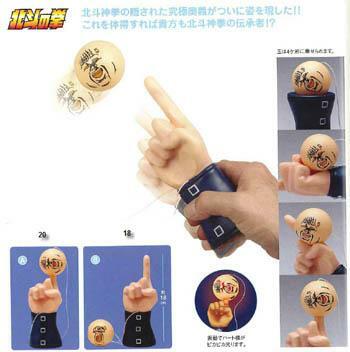 Release your grip on ego and use all of your god given skills to attempt to balance the ball that's tethered to the Hokuto no Ken fist + wrist. There's about 1.5 feet of slack on the string so that the ball will move freely as you toss the fist around. 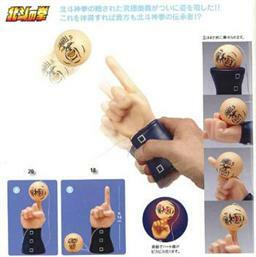 The goal is to send the ball swinging so that it gets perched on the knuckles, on the wrist, or upon the pointed index finger of the Hokuto no Ken fist. When the ball's being swung, the tension on the string causes the LEDs inside to flash with crimson glitter. The fist measures 18cm in length or approximately 7" from index finger to wrist. Preorders are shipping today and new orders are welcome at US$15 per fist + wrist + ball.